An artist’s impression of the new headquarters. 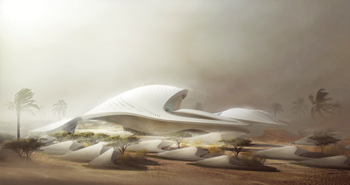 The Bee’ah headquarters building aims for Leed (Leadership in Energy and Environmental Design) Platinum Certification, with ultra-low carbon and minimal water consumption in operation and minimised material consumption in construction. The new building and site will also be used as a learning resource to demonstrate practical environmental awareness to the wider community. Designed in response to its natural environment, the new building resonates with its desert context as a series of dunes orientated to optimise the prevailing Shamal winds and give its interiors high quality daylight while limiting the quantity of glazing exposed to the harsh sun.